The next E-letter will be mailed out at the beginning of January 2019. Calling all Young Professionals! The CSS Young Professionals organization has just created a new Linkedin group, which will be used to post YP news, communicate YP events, and provide a platform for general YP discussion. All young professionals within CSS are encouraged to join the group by visiting this page: https://www.linkedin.com/groups/13637643/. If you have any questions, please contact Jeff Peters at petersjr@utrc.utc.com. This message is to announce that starting from November 2019 IEEE Control Systems Letters is indexed in Scopus. The first papers have already included in the database, the others will be gradually added. The IEEE Control Systems Society Publications Content Digest is a novel and convenient guide that helps readers keep track of the latest published articles. The CSS Publications Content Digest, available at http://ieeecss.org/publications-content-digest provides lists of current tables of contents of the periodicals sponsored by the Control Systems Society. Each issue offers readers a rapid means to survey and access the latest peer-reviewed papers of the IEEE Control Systems Society. We also include links to the Society’s sponsored Conferences to give readers a preview of upcoming meetings. After two editions at Polytech Nancy, the third edition of this spring doctoral school on data-based modeling (system identification) will be organized on the campus of the Ecole Centrale de Lyon. The school consists of a series of lectures and of exercise sessions aiming at covering the fundamentals of data-driven modeling approaches as well as more advanced topics. The course is eligible for scientific doctoral modules. The school is thus mainly aimed at an audience of PhD students, but is also open to any other persons interested in the topic of data-based modeling. The deadline for registration is 31 January 2019. We will hold an IGSC of 5 days (21 hours) from the 29th to the 3rd of May at Imperial College London on Model Reduction. For more information, please follow the links below. Early registration closes on the 28 of February. "A. Varga, Solving Fault Diagnosis Problems – Linear Synthesis Techniques, Springer, 2017." The current version of FDITOOLS is V1.0, dated November 30, 2018. This version covers all synthesis procedures described in the above book and, additionally, includes a comprehensive collection of analysis functions, as well as functions for an easy setup of synthesis models. The codes have been developed under MATLAB 2015b and have been tested with MATLAB 2016a through 2018b. To use the functions, the Control System Toolbox (Version 9.10 or later) and the Descriptor System Tools (DSTOOLS) collection (Version V0.71 or later) must be installed in MATLAB running under 64-bit Windows 7, 8, 8.1 or 10. A comprehensive documentation of FDITOOLS V1.0 is available on arXiv at https://arxiv.org/abs/1703.08480 . Short course on "Game Theory and Distributed Control"
As part of the EECI 2019 International Graduate School on Control, there will be a one week short course by Profs. Jason Marden (UCSB) and Jeff Shamma (KAUST) on "Game theory and distributed control". This course presents an introduction to game theory and how it can be used as an effective design approach for distributed architecture control systems, with various illustrative examples of multi-agent distributed coordination. The course, as well as housing, dining, and recreation facilities, will all be on the KAUST campus (one hour by car north of Jeddah). KAUST will assist in the visa process as well as local transportation and accommodations. To have sufficient lead time for these arrangements, the deadline for registration (with both EECI & KAUST) is Feb 10, 2019. Authors: Liu, Q., Wang, Z., He, X. “Stochastic Control and Filtering over Constrained Communication Networks” presents up-to-date research developments and novel methodologies on stochastic control and filtering for networked systems under constrained communication networks. It provides a framework of optimal controller/filter design, resilient filter design, stability and performance analysis for the systems considered, subject to various kinds of communication constraints, including signal-to-noise constraints, bandwidth constraints, and packet drops. Several techniques are employed to develop the controllers and filters desired, including: recursive Riccati equations; matrix decomposition; optimal estimation theory; and mathematical optimization methods. Readers will benefit from the book’s novel concepts, models and methodologies that have practical significance in control engineering and signal processing. “Stochastic Control and Filtering over Constrained Communication Networks” is a practical research reference for engineers dealing with networked control and filtering problems. It is also of interest to academics and students working in control and communication networks. Authors: Lauer, F., Bloch, G.
“Hybrid System Identification” helps readers to build mathematical models of dynamical systems switching between different operating modes, from their experimental observations. It provides an overview of the interaction between system identification, machine learning and pattern recognition fields in explaining and analysing hybrid system identification. It emphasises the optimization and computational complexity issues that lie at the core of the problems considered and sets them aside from standard system identification problems. The book presents practical methods that leverage this complexity, as well as a broad view of state-of-the-art machine learning methods. The authors illustrate the key technical points using examples and figures to help the reader understand the material. The book includes an in-depth discussion and computational analysis of hybrid system identification problems, moving from the basic questions of the definition of hybrid systems and system identification to methods of hybrid system identification and the estimation of switched linear/affine and piecewise affine models. The authors also give an overview of the various applications of hybrid systems, discuss the connections to other fields, and describe more advanced material on recursive, state-space and nonlinear hybrid system identification. “Hybrid System Identification” includes a detailed exposition of major methods, which allows researchers and practitioners to acquaint themselves rapidly with state-of-the-art tools. The book is also a sound basis for graduate and undergraduate students studying this area of control, as the presentation and form of the book provides the background and coverage necessary for a full understanding of hybrid system identification, whether the reader is initially familiar with system identification related to hybrid systems or not. This book gives readers in-depth know-how on methods of state estimation for nonlinear control systems. It starts with an introduction to dynamic control systems and system states and a brief description of the Kalman filter. In the following chapters, various state estimation techniques for nonlinear systems are discussed, including the extended, unscented and cubature Kalman filters. The cubature Kalman filter and its variants are introduced in particular detail because of their efficiency and their ability to deal with systems with Gaussian and/or non-Gaussian noise. The book also discusses information-filter and square-root-filtering algorithms, useful for state estimation in some real-time control system design problems. A number of case studies are included in the book to illustrate the application of various nonlinear filtering algorithms. Nonlinear Filtering is written for academic and industrial researchers, engineers and research students who are interested in nonlinear control systems analysis and design. The chief features of the book include: dedicated coverage of recently developed nonlinear, Jacobian-free, filtering algorithms; examples illustrating the use of nonlinear filtering algorithms in real-world applications; detailed derivation and complete algorithms for nonlinear filtering methods, which help readers to a fundamental understanding and easier coding of those algorithms; and MATLAB® codes associated with case-study applications, which can be downloaded from the Springer Extra Materials website. This book provides a new approach to the control of food transformation processes, emphasizing the advantage of considering the system as a multivariable one, and taking a holistic approach to the decision-making process in the plant, considering not only the technical but also the economic implications of these decisions. In addition, it presents a hierarchical structure for the global control of the plant, and includes appropriate techniques for each of the control layers. The book addresses the challenges of modelling food transformation processes, using both traditional system-identification techniques and, where these prove impractical, models based on expert knowledge and using fuzzy systems. The construction of optimal controllers for each of these types of models is also discussed, as a means to close a feedback loop on the higher-level outputs of the process. Finally, the problem of production planning is covered from two standpoints: the traditional batch-sizing problem, and the planning of production throughout the season. Systematic season-wide production planning is built upon the models constructed for the control of the plant, and incorporates market- and business-specific information. Examples based on the processing of various foodstuffs help to illustrate the text throughout, while the book’s closing chapter presents a case study on advances in the processing of olive oil. Given its scope, the book will primarily be of interest to two groups of readers: food engineering practitioners and students, who are familiar with the characteristics of food processes but have little or no background in control engineering; and control engineering researchers, students and practitioners, whose situation is just the opposite, and who wish to learn more about food engineering and its specific challenges for control. • a generalization of the subspace identification approach for batch processes; and applications to several detailed case studies, ranging from a complex simulation test bed to industrial data. The book’s proposed methodology employs statistical tools, such as partial least squares and subspace identification, and couples them with notions from state-space-based models to provide solutions to the quality control problem for batch processes. Practical implementation issues are discussed to help readers understand the application of the methods in greater depth. The book includes numerous comments and remarks providing insight and fundamental understanding into the modeling and control of batch processes. Modeling and Control of Batch Processes includes many detailed examples of industrial relevance that can be tailored by process control engineers or researchers to a specific application. The book is also of interest to graduate students studying control systems, as it contains new research topics and references to significant recent work. Observability and Controllability of General Linear Systems treats five different families of the linear systems, three of which are new. The book begins with the definition of time together with a brief description of its crucial properties. It presents further new results on matrices, on polynomial matrices, on matrix polynomials, on rational matrices, and on the new compact, simple and elegant calculus that enabled the generalization of the transfer function matrix concept and of the state concept, the proofs of the new necessary and sufficient observability and controllability conditions for all five classes of the studied systems. - Generalizes the state space concept and the complex domain fundamentals of the control systems unknown in previously published books by other authors. - Addresses the knowledge and ability necessary to overcome the crucial lacunae of the existing control theory and drawbacks of its applications. - Outlines new effective mathematical means for effective complete analysis and synthesis of the control systems. - Upgrades, completes and broadens the control theory related to the classical self-contained control concepts: observability and controllability. - Provides information necessary to create and teach advanced inherently upgraded control courses. - Opens new research directions. Trackability and Tracking of General Linear Systems deals with five classes of the systems, three of which are new, begins with the definition of time together with a brief description of its crucial properties and with the principles of the physical uniqueness and continuity of physical variables. They are essential for the natural tracking control synthesis. The book presents further new results on the new compact, simple and elegant calculus that enabled the generalization of the transfer function matrix concept and of the state concept, the completion of the trackability and tracking concepts together with the proofs of the trackability and tracking criteria, as well as the natural tracking control synthesis for all five classes of the systems. - Crucially broadens the state space concept and the complex domain fundamentals of the dynamical systems to the control systems. - Addresses the knowledge and ability necessary to study and design control systems that will satisfy the fundamental control goal. - Upgrades, completes and essentially generalizes the control theory beyond the existing boundaries. The 58th IEEE Conference on Decision and Control (2019) in Nice, France will offer full-day and half-day pre-conference workshops, addressing current and future topics in control systems from experts from academia, research institutes, and industry. Workshop proposals are invited on these topics. Workshop proposals are due May 2, 2019.
be submitted through PaperPlaza by the due date. The workshops will be offered based on the selection by the organizing committee and viable attendance. the workshop fees will be refunded in full. William Levine, University of Maryland, College Park, U.S.
Richard Stockbridge, University of Wisconsin-Milwaukee, U.S.
Michael Demetriou, Worcester Polytechnic Institute, U.S.
Bozenna Pasik-Duncan, University of Kansas, U.S.
Amit Surana, United Technologies Research Center, U.S. Please visit http://siamct19.cuit.edu.cn/INFO_FOR_PARTICIPANTS/Submissions.htm for detailed submission information. For additional information, contact siamct19@cuit.edu.cn. The global controls community and the wider scientific community interested in the broad range of questions and implications emerging from the relationships between humans and technology are invited to participate in the Second IFAC Conference on Cyber-Physical & Human Systems (CPHS). Taking place in Miami just days before the 2018 Conference on Decision and Control (CDC), CPHS 2018 aims to bring together researchers and practitioners from academia and industry to share scientific and technological advances as well as gain a deeper understanding of the interactions between cyber-physical systems and humans. Of particular focus are human-centered technologies in a wide-range of applications including transportation, energy, robotics, manufacturing, and health-care. Miami is a popular vacation spot, not only in the United States, but in the world! The Miami area offers multiple attractions for all. Conveniently located in Downtown Miami, the Hyatt Regency hotel captures the spirit of the city. With its striking white towers overlooking the Miami River, Hyatt Regency Miami is a landmark hotel offering first rate service. The hotel enjoys easy access to popular attractions such as Brickell City Center for world-class shopping, Wynwood Art District with galleries and museums, the Adrienne Arsht Center for the performing arts, Coral Gables with a Venetian Pool and botanical garden, and the Latin flavor of Little Havana. The hotel is a just a short 15-minute drive from South Beach. There’s no better way to enjoy the Florida sunshine than with Hyatt Regency Miami as your home base. The conference program, through a combination of paper and poster presentations, will showcase the interactions between cyber-physical systems and humans during December 14 and 15. Two plenary lectures – one by a prominent social scientist and the other by a roboticist -- are featured. A panel exploring the interface between engineers and social-scientists, and a mini-workshop on transdisciplinary communication and collaboration have been arranged. A special session that showcases hardware and software demonstrations of current CPHS research is also included. The IFAC CPHS Young Author Prize will be awarded to the best paper by a student author, and the CPHS Best Poster Prize to the best interactive presentation. Accepted papers will be published in the open-access IFAC-PapersOnLine series hosted on ScienceDirect (http://www.sciencedirect.com/). Advance registration is now open and is highly recommended. All attendees must register. See the CPHS 2018 website for registration fees and other details. The Organizing Committee has the pleasure to invite you to contribute and participate in the 3rd IFAC Workshop on Thermodynamic Foundation of Mathematical Systems Theory to be held in Louvain-la-Neuve, Belgium, on July 3-5, 2019. Three plenary talks will be presented by Massimiliano Esposito (University of Luxembourg), Christian Jallut (Universite Claude--Bernard Lyon 1), and Arjan van der Schaft (Uiversity of Groningen). On behalf of the ICUAS'19 Organizing Committee, this is to invite you to submit your contributions to the 2019 International Conference on Unmanned Aircraft Systems (ICUAS'18; http://www.uasconferences.com). The conference is co-sponsored by the IEEE CSS and RAS, and several other organizations. The 2019 International Conference on Unmanned Aircraft Systems, ICUAS'19, will be held on June 11-14, in the Atlanta Marriott Buckhead Hotel and Conference Center which is situated in a supreme location in the heart of Atlanta. June 11 will be a Workshop/Tutorial full-day, followed by a three-day technical Conference on June 12-14. Judging from the interest ICUAS has drawn over the past years and its growth, ICUAS'19 is expected to continue on this path and attract the highest number of participants from academia, industry, federal and state agencies, government, the private sector, users, practitioners and engineers who wish to be affiliated with and contribute technically to this highly demanding and evolving and expanding field. ICUAS'19 is fully sponsored by the ICUAS Association, which is a non-profit organization. Information about the Association may be found at www.icuas.com. The major themes of ICUAS'19 will be: design for trusted and assured autonomy, metrics for autonomy, and design for resilience. These focus area topics are center-stage in the attempt to design and build high-confidence UAS/RPAS. In addition, ICUAS'19 will include a separate track on regulations, policy, legal and ethical issues that are essential to allow for integration of UAS/RPAS in the national airspace. National and international organizations, agencies, industry, military and civilian authorities are working towards defining roadmaps of UAS/RPAS expectations, technical requirements and standards that are prerequisite to their full utilization, as well as legal, policy and ethical issues. The next generation of UAS/RPAS is expected to be used for a wide spectrum of civilian and public domain applications. Challenges to be faced and overcome include, among others, see-and-avoid systems, robust and fault-tolerant flight control systems, payloads, communications, levels of autonomy, manned-unmanned swarms, network-controlled swarms, as well as challenges related to policies, procedures, regulations, safety, risk analysis assessment, airworthiness, certification issues, operational constraints, standardization and frequency management, all of paramount importance, which, coupled with 'smart', 'environmentally friendly' cutting edge technologies will pave the way towards full integration of UAS/RPAS with manned aviation and into the respective national airspace. ICUAS'19 aims at bringing together different groups of qualified military and civilian representatives worldwide, organization representatives, funding agencies, industry and academia, to discuss the current state of unmanned aviation advances, and the roadmap to their full utilization in civilian and public domains. Special emphasis will be given to research opportunities, and to 'what comes next' in terms of the essential technologies that need to be utilized to advance the state-of-the-art. Conference topics include (but not limited to): Airspace Control; Integration; See/Sense-Detect-and-Avoid Systems; Airspace Management; Interoperability; Security; Airworthiness; Levels of Safety; Sensor Fusion; Autonomy; Manned/Unmanned Aviation; Smart Sensors; Biologically Inspired UAS; Micro- and Mini- UAS; Standardization; Certification; Networked UAS; Technology Challenges; Control Architectures; Payloads; Training; Energy Efficient UAS; Path Planning and Navigation; UAS Applications; Environmental Issues; Regulations; UAS Communications; Fail-Safe Systems; Reliability of UAS; UAS Testbeds; Frequency Management; Risk Analysis; UAS Transportation Management (UTM); Policy/Regulation/Law Aspects. Through Keynote addresses, round table panel discussions and presentations, it is expected that the outcome of the Conference will be a clear understanding of what industry, military, civilian, national/international authorities need, and what are the crucial next steps that need to be completed before UAS/RPAS are utilized in everyday life applications. .
Papers must be submitted electronically. Go to https://controls.papercept.net. Click on "Submit a Contribution to ICUAS'19" and follow the steps. The paper format mufst follow IEEE paper submission rules. Submitted papers should be classified as Contributed, Poster or Invited Session papers. The maximum number of pages for a contributed/invited paper submission is 10, and for a poster paper is 6. Accepted, contributed/invited session papers only, will be allowed up to two additional pages for a charge of $100 per additional page. Illustrations and references are included in the page count. Poster papers will allow for researchers/practitioners to present novel/cutting edge ideas with potential, however, not yet fully developed. Invited Sessions: Proposals must be submitted/uploaded electronically. A Summary Statement describing the motivation and relevance of the proposed session, paper titles and author names must be uploaded electronically by February 12, 2019. Authors must also submit full versions of invited papers electronically, marked as 'Invited Session Paper'. Workshops/Tutorials: Proposals for workshops/tutorials should contain title, the list of speakers, and extended summaries (2000 words) of their presentations. Proposals must be sent by e-mail to the Tutorial/ Workshop Chair by February 12, 2019.
Review Process: All submitted papers will undergo a peer review process following IEEE rules and standards. Authors will be notified of results at the latest by April 15, 2019. Accepted papers must be uploaded electronically no later than May 10, 2019. Authors are encouraged to accompany their presentations with multimedia material, which will be included in the Conference Digital Proceedings. Only Contributed or Invited Session papers will be acquired by IEEE and they appear in IEEE Xplore. Paper presentation: Contributed/Invited Session papers will be grouped in Technical Sessions and will be allocated 20 minutes for oral presentation, which includes questions from the audience. Poster papers will be grouped based on subject. Presenters are encouraged to supplement the poster with additional slides, video or software demonstrations, etc. All poster paper presentations will be scheduled in one day. Welcome and look forward to receiving your contributions and attendance to the ICUAS'19! For information about the ICUAS Association, Inc., see www.icuas.com. The aim of the ICCAS is to bring together researchers and engineers worldwide to present their latest works, and disseminate the state-of-the-art technologies related to control, automation, robotics, and systems. The conference invites three types of submission: "Regular Paper", "Research Poster Paper", and "Organized (Invited) Session/Mini-symposium Paper". ICCAS 2019 will be held on October 15~18, 2019 at ICC Jeju in Jeju, Korea. Jeju is a very beautiful and relaxing island, and selected as the World Natural Heritage. The aim of ICCAS 2019 is to bring together professors, researchers, engineers and students worldwide to present their recent works and discuss the state-of-the-art technologies related to control, automation, robotics and systems. The 4th International Conference on Control and Fault-Tolerant Systems, SysTol’19 will be held from September 18-20, 2019 in Casablanca, Morocco. Please visit our website http://www.systol.org/systol19/ for more information. - to provide a forum for industry to signal its needs and priorities. The three previous editions of the International Conference on Control and Fault-Tolerant Systems (Systol’10, Systol’13 and SysTol’16) were a success and demonstrated the demand for establishing a permanent scientific forum in the general area of system monitoring, fault diagnosis and fault-tolerant control. The fourth conference on Control and Fault-Tolerant Systems (SysTol’19), through its technical program, will provide a unique opportunity for the academic and industrial community to formulate new challenges, share solutions and discuss future research directions. It is our great pleasure to invite You to participate in the 24th International Conference on Methods and Models in Automation and Robotics, MMAR 2019 to be held in Międzyzdroje, Poland, from August 26th to August 29th, 2019. – attract young people to study and work in the field. The participants of the 24th International MMAR Conference will have the opportunity to take part in the wide spectrum of categories for technical presentations, including plenary lectures, regular papers of both lecture and poster session types, and panel discussion. We look forward to seeing our old and new friends in Poland. You are kindly invited to participate in the 24th International MMAR Conference in Międzyzdroje, Poland. The proceedings of the conference will be submitted for review and approval for inclusion in the IEEE Xplore® Digital Library and will be submitted for inclusion in the Conference Proceedings Citation Index - Science (ISI Web of Science). Modeling crowds composed of a large number of interacting agents has been an extremely challenging problem for the mathematical community. This led to the development of several key mathematical theories, catching different aspects of crowds, ranging from mean-field limits for interacting particles, to hyperbolic systems for road traffic models, to dynamics on graphs and networks, to stochastic models, and to adapted numerical methods. The conference aims to gather together different communities working on two connected problems for crowds. On one side, modeling crowds keeps being a stimulating issue, in particular for understanding the phenomenon of self-organization: how can a set of simple one-to-one interactions between agents produce macroscopic patterns, such as lines, swarms and flocks? Several mathematical communities have proposed different tools for modeling crowds, such as microscopic and macroscopic models, stochastic approaches, mean-field games or conservation laws. On the other side, the control of crowds is of paramount interest: how can an external control enforce a desired behavior to the crowd? In particular, how to drive a crowd towards an efficient macroscopic pattern, such as lines for egress problems? The control community has proposed a large spectrum of methods, such as control on graphs, numerical methods for optimization of conservation laws, control of the continuity equation. The two aspects of proper modeling and efficient control are then intimately connected. 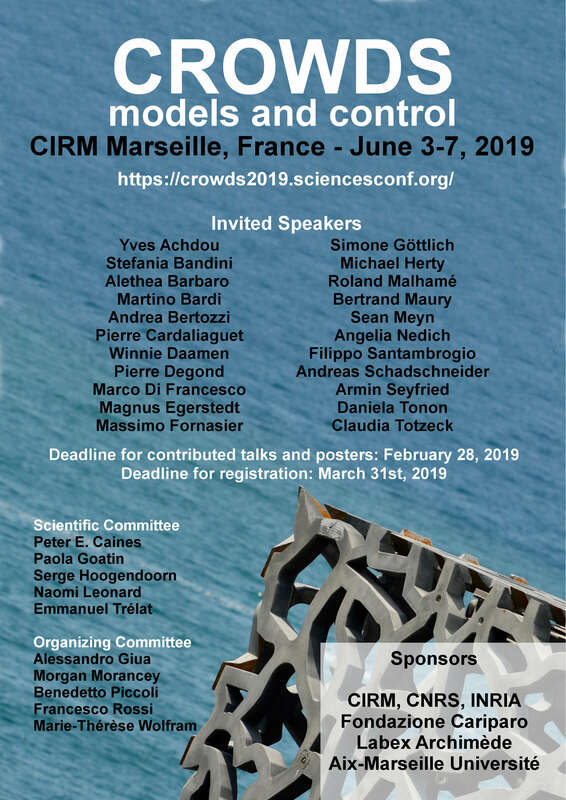 For this reason, the conference aims to strengthen connections between researchers in modeling and control of crowds. We welcome presentations by researchers in the topics of the conference. This conference aims to gather scientists working on crowds both from the modeling point of view and from the control point of view. Contributions from both communities are then very welcome. If you are interested in delivering a talk, please submit an abstract (200-400 words). We warmly encourage Ph.D. students and early-stage researchers to apply for this opportunity. A limited amount of free housings at the CIRM are available for speakers. See guidelines below. We also organize a poster session on topics of the conference. Please submit an abstract (200-400 words) on the website of the conference. Again, we warmly encourage Ph.D. students and early-stage researchers to apply for this opportunity. Poster abstract submissions are due by December 10th, 2018. Selected posters will be given 3 minutes each for oral (pitch) presentation during the event. The 27th Mediterranean Conference on Control and Automation (MED 2019) will be held on the 1-4 of July 2019 in Akko, Israel. Akko is situated on the Phoenician northern part of the Mediterranean coast of Israel, with an exceptional history and rich cultural heritage, spanning over 4,000 years. It has been designated by UNESCO as a World Heritage site. MED 2019 will include tutorials and workshops, a technical program of presentations, keynote lectures and social events. It offers a great opportunity for academics, researchers and industrial players working in control and automation to network together, present research progress and address new challenges. The conference will include a wide range of topics on systems, automation, robotics and control including theory, related hardware, software and communication technologies, as well as applications. All submissions are processed electronically via the PaperCept paper management system. All papers will be peer reviewed. Accepted and presented papers will be published in the digital conference proceedings and made available on IEEE Xplore. 22 January 2019: Contributed papers, invited sessions, and tutorial proposals are due. 18 April 2019: Notification of acceptance/rejection. 15 May 2019: Final submissions due. Please visit the conference website (https://med19.net.technion.ac.il) for up-to-date details on all conference activities and submission instructions. We look forward to your submissions and participation! On behalf of the ISAS 2019 Organizing Committee, this is to invite you to submit your contributions to the The 3rd International Symposium on Autonomous Systems (ISAS 2019), May 29-31, 2019, Shanghai, China (www.isas.cqu.edu.cn). The 3rd International Symposium on Autonomous Systems, ISAS 2019, will be held in Shanghai, China, during May 29-31, 2019. The conference is organized by Chongqing University, Shanghai Jiao Tong University, China, Star Institute for Intelligent Systems, China, University of Texas at Arlington, USA, and technically co-sponsored by IEEE Computational Intelligence Society, Technical Committee on Reliable Control Systems, Chinese Association of Automation, State Key Laboratory of Synthetical Automation for Process Industries, Northeastern University, China, and Key Laboratory of System Control and Information Processing, Ministry of Education of China. ISAS focuses on both theory and applications mainly covering the topics of artificial intelligence, control, automation, robotics and autonomous systems. In addition to the technical sessions, there will be invited sessions, panel sessions and keynote addresses.
. Robotics: Modeling and identification, Robot control, Mobile robotics, Mobile sensor networks, Perception systems, Micro robots and micro-manipulation, Visual servoing, Search, rescue and field robotics, Robot sensing and data fusion, Localization, navigation and mapping, Dexterous manipulation, Medical robots and bio-robotics, Human centered systems, Space and underwater robots, Tele-robotics, Mechanism design and applications.
. Emerging Technologies: Internet of things, Cyber-physical systems, Smart buildings, Smart grid, Energy management systems, Big data, Electric vehicles and intelligent transportation. Welcome and look forward to receiving your contributions and attendance to the ISAS 2019! The Quantum Science, Engineering and Technology Conference (qSET) aims to bring together leading experts and students in the fields of quantum science, engineering and technology to present their best research and share their knowledge, in the form of plenary talks, keynote talks, invited talks, posters and pre-conference workshops. The conference covers a broad range of topics within quantum science and technology, including quantum computation quantum computation, quantum communication, quantum control, quantum engineering, quantum sensing, quantum simulation and quantum navigation. The first conference will take place in Canberra, Australia, 8-11 April 2019. Attendees are strongly encouraged to complete their registration at their earliest convenience. Participants are welcome to submit poster abstracts for reviewing and are also welcome to organize half-day or one-day pre-conference workshops (on 8 April 2019). This site will be regularly updated. For all enquiries please contact local qSET 2019 organizers. Applied control for industrial and non-industrial areas, applied control for robots, hybrid systems, intelligent control, mechatronics, mobile robots, modeling of dynamic systems, multi-robot systems, control of power systems, process control and automation, process optimization, sensing and sensor fusion, system identification, systems and signals, control of biological systems and biochemical processes. Paper submission: The program committee invites you to submit 4 to 6 pages long papers in English through www.ieeeccac2019.com. Submitted papers to CCAC must be original, not previously published or accepted for publication elsewhere and must not be submitted to any other event or publisher during the entire review process. IEEE policy regarding plagiarism and duplicate submission/publication will be strictly enforced. Accepted and presented papers will be published in the IEEE CCAC 2019 Conference Proceedings and submitted to IEEE Xplore®. Only English versions will be published in IEEE Xplore®. Venue: The 4th IEEE CCAC 2019 will be held in Medellin from the 15th to 18th of October 2019. Medellin, the 2nd largest city in Colombia, is a vibrant city that offers a wide variety of tourist, gastronomic and cultural attractions. ICCPS 2019 seeks high-quality technical abstracts, demos, and posters describing work-in-progress in the area of cyber-physical systems (CPS), including preliminary work on theory, platform design and implementation, verification and validation, empirical case studies, and other work that has potential to advance the state of the art in CPS. Authors of each accepted abstract will give a brief presentation at the WiP session, and may also give a demo and/or have a poster afterward. ICCPS 2019 work-in-progress abstracts, demos, and posters should focus on the same areas of the main conference. Please refer to ICCPS 2019 CFP link (http://iccps.acm.org/2019/ICCPS19-CFP.pdf) for details. Both theory and applications related works are encouraged. All submitted abstracts must be in English and must be in a single PDF file following the same guidelines as ICCPS 2019 (http://iccps.acm.org/2019/?q=Submissions). Abstract manuscripts should have a main body with no more than 2 pages (including references). They will be evaluated based on the technical merit and innovation as well as their potential to stimulate interesting discussions and exchanges of ideas at the conference. Both academic and industrial submissions are encouraged. All accepted abstracts will be published the ICCPS 2019 proceedings. Submissions must be attached to an email sent by 23:59pm GMT-12 on Thursday – Jan 24, 2019 (FIRM) to the ICCPS 2019 Demo and WiP Chair James Weimer (weimerj@seas.upenn.edu) with the exact subject line: ICCPS 2019 WiP submission. In addition to giving a brief presentation of the work, each accepted abstract will have the option of giving a demo or having a poster (or neither or both). The poster and demo session will provide a forum for researchers to showcase ongoing work and obtain feedback from the CPS community, in addition to the discussions at the WiP presentation session. Authors wishing to give demos should clearly describe in their abstract what will be demonstrated and how the contributions will be illustrated interactively. If a demonstration requires wireless connectivity or other special arrangements (in addition to a table and power which will be provided to all demos), please describe them clearly in the abstract as well. Authors wish to have a poster should also mention that in the abstract, along with a brief summary of what the poster will show. The 22nd International Conference on Process Control, technically sponsored by IEEE CSS Process Control TC and by a National member organisation of IFAC, will take place between June 11 and 14, 2019 at Strbske Pleso, High Tatras, Slovakia. Accepted papers will be submitted to the IEEE-Xplore digital library. Situated on the border between Slovakia and Poland, High Tatras is one of the most impressive national parks in the Slovakia. It is a home to a wide variety of wildlife. Many kilometres of well marked pathways can be explored ranging from easy to extremely difficult. Strbske pleso is a renowned place for its summer and winter sport activities. The objective of the conference is to bring together theoretical experts and control systems specialists, to evaluate new possibilities of techniques, design procedures and instruments in process control projects. Papers for presentation may range from theoretically rigorous research works to industrial applications. The conference will feature plenary lectures delivered by prof. Sebastian Engell (TU Dortmund) and by prof. Denis Dochain (UCLouvain). In addition, a tutorial workshop on Nonlinear Model Predictive Control and its applications will take place during the conference. The conference accepts two types of submissions -- full papers and abstract-only contributions. For full papers, authors have the option to select a preference for presentation format (talk or poster), although the organizers will make a final decision based on an effective overall programme design. Accepted full papers will be submitted to the IEEEXplore website. The registration fee is 380 EUR (280 EUR for PhD students, 10% reduction for IEEE members) and includes participation at the conference and exhibitions, conference proceedings, and banquet. Accommodation at the conference hotel and full board during the duration of the conference can be booked at a reduced rate of 70 EUR/night. We are looking forward to meeting you at the conference next year! The workshop will cover the subjects of (vehicular) traffic flow control and estimation as well as traffic flow dynamics modelling for control and estimation, with particular emphasis on PDE-based techniques. Both methodological and practical aspects will be addressed. Miroslav Krstic, University of California, San Diego, USA. Iasson Karafyllis, National Technical University of Athens, Greece. Christian Claudel, University of Texas at Austin, USA. Maria Laura Delle Monache, Inria, France. Benedetto Piccoli, Rutgers University, USA. Gabor Orosz, University of Michigan, Ann Arbor, USA. Nikolaos Bekiaris-Liberis, Technical University of Crete, Greece. Maria Laura Delle Monache, INRIA Grenoble-Rhone Alpes, France. Delphine Bresch-Pietri, MINES ParisTech, France. Rafael Vazquez, University of Seville, Spain. The workshop will take place on Sunday December 16, 2018 during the 57th IEEE Conference on Decision and Control at the Fontainebleau in Miami Beach, FL, USA. Please note that only people who have registered for the conference can register for the workshop.